After sunset the only lights that illuminate the Panteón General, one of Oaxaca’s largest cemeteries, are the candles placed at the base of every grave. The city of tombs glows with an eerie orange flicker as people from the surrounding communities come to honor their dead. It’s such a powerful experience that tourists from every corner of the globe make the pilgrimage to the cemetery every November 1. Weaving through the narrow pathways that snake throughout the lively place, we immediately spot the ofrendas, memorial-like altars arranged by family members on each grave. Piles of fluffy marigolds, photos and tokens of remembrance mark the burial sites, which also often showcase skull statuettes and food—most commonly the Pan de Muerto, or Day of the Dead bread. It’s also common to see bottles of beer, soda, juice and mezcal placed among the arrangements to entice the deceased back to the earthly realm for the celebrations. Mezcal plays a role in most (if not all) Oaxacan milestones, rituals and holidays, including the Day of the Dead. The indigenous spirit is so ingrained in Mexican culture that locals like Alberto Morales believe it’s even consumed after death. Morales is a fifth-generation mezcal distiller for Wahaka Mezcal, and last Día de los Muertos, he guided us through the festivities. Naturally, he brought a bottle of espadín along to mark the occasion. As we sipped the earthy liquid out of a few veladoras, or candle holders repurposed as drinking vessels, the soulful spirit heightened our awareness of the surroundings. The night was far from somber as kids with skull face paint took selfies near mausoleums and families camped out with coolers of beer and played songs on stereos, and despite the somewhat ghostly location, love radiated from every corner of the cemetery. Muertos festivities, and the drinks that define them, aren’t limited to cemeteries. Earlier that day, we visited Morales’ palenque, or distillery, a modest operation connected to his home. 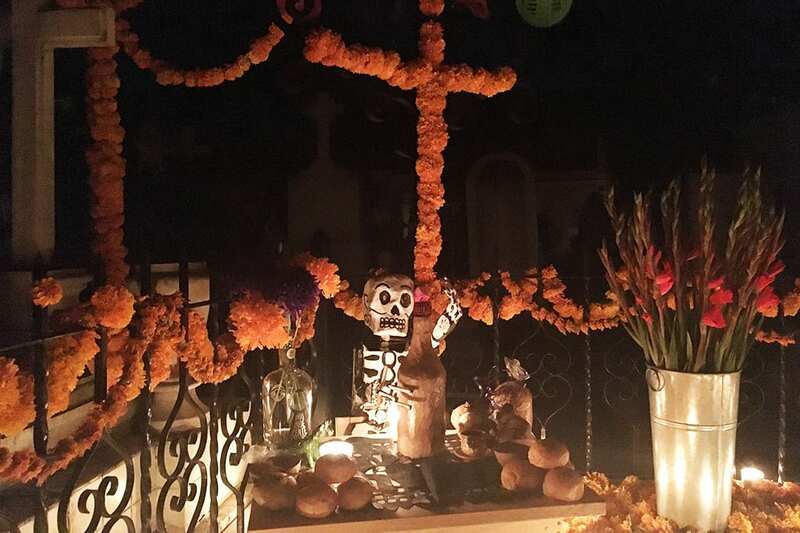 In the dining room, the Morales family displayed their own altar, with photos of the deceased arranged next to bottles of Corona, Coca-Cola and mezcal. Before lunch, Morales’ wife Ana offered everyone a roll of muertos bread along with a piping-hot mug of champurrado, a chocolate drink dating back to Aztec times. Every family has their own champurrado recipe, but most are built on a base of masa and water or milk, then flavored with chocolate and canela (cinnamon) for extra flavor. This combination is enjoyed before every meal during Muertos because, “that’s how the dead would do it,” says Morales. Ana’s champurrado had a fresh cacao flavor and perfect balance of sweetness to bitterness. It was rich and creamy, with frothy bubbles and a thick texture, and upon encouragement, we added a nip of espadín for good measure. As lunch arrived, more bottles of mezcal appeared. Varietals like grassy Jabali and vegetal Tepeztate cut through the richness of the mole con pollo, a traditional mole recipe with chicken, chile pasilla, sesame seeds and other ingredients. Morales talked about his mezcal-making ancestors while sipping mezcal as a gesture of remembrance. He explained that because these drinks date back centuries in Mexican culture, the offerings are meant to honor his family’s heritage. The drinks are consumed every year because that’s what his parents and grandparents did to honor their ancestors too, and it’s clear that these traditions are just as much about life as they are about death.